"For years, people had treated the poor conductivity of organics as an unavoidable fact, and this shows that that's not always the case," said Stephen Forrest, the Peter A. Franken Distinguished University Professor of Engineering and Paul G. Goebel Professor of Engineering at U-M, who led the research. Organics' notoriously poor conductivity, however, has slowed research. Forrest believes this discovery could change the game. The findings are detailed in a study published Jan. 17 in Nature. The team showed that a thin layer of fullerene molecules—the curious round carbon molecules also called Buckyballs—can enable electrons to travel up to several centimeters from the point where they're knocked loose by a photon. That's a dramatic increase; in today's organic cells, electrons can travel only a few hundred nanometers or less. Electrons, moving from one atom to another, make up the electric current in a solar cell or electronic component. Materials like silicon, used in today's inorganic solar cells and other semiconductors, have tightly bound atomic networks that make it easy for electrons to travel through the material. But organic materials have much looser bonds between individual molecules, which can trap electrons. This has long been an Achilles' heel of organics, but the new discovery shows that it may be possible to tweak their conductive properties for specific applications. The ability to make electrons move more freely in organic semiconductors could have far-reaching implications. 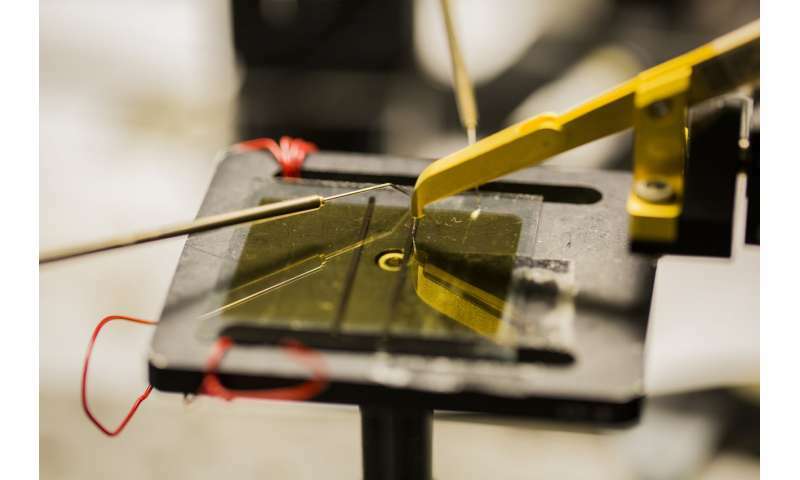 For example, the surface of today's organic solar cells must be covered with a conductive electrode that collects electrons at the point where they're initially generated. But freely moving electrons can be collected far away from their point of origination. This could enable manufacturers to shrink the conductive electrode into an invisible grid, paving the way for transparent cells that could be used on windows and other surfaces. "This discovery essentially gives us a new knob to turn as we design organic solar cells and other organic semiconductor devices," said Quinn Burlingame, a U-M electrical engineering and computer science graduate researcher and author on the study. "The possibility of long-range electron transport opens up a lot of new possibilities in device architecture." Burlingame says that the initial discovery of the phenomenon came as something of an accident as the team was experimenting with organic solar cell architecture in hopes of boosting efficiency. Using a common technique called vacuum thermal evaporation, they layered in a thin film of C60 fullerenes—each made of 60 carbon atoms—on top of an organic cell's power-producing layer, where the photons from sunlight knock electrons loose from their associated molecules. On top of the fullerenes, they put another layer to prevent the electrons from escaping. They discovered something they'd never seen before in an organic—electrons were skittering unfettered through the material, even outside the power-generating area of the cell. Through months of experimentation, they determined that the fullerene layer formed what's known as an energy well—a low-energy area that prevents the negatively charged electrons from recombining with the positive charges left behind in the power-producing layer. "You can imagine an energy well as sort of a canyon—electrons fall into it and can't get back out," said Caleb Cobourn, a graduate researcher in the U-M Department of Physics and an author on the study. "So they continue to move freely in the fullerene layer instead of recombining in the power-producing layer, as they normally would. It's like a massive antenna that can collect an electron charge from anywhere in the device." Forrest cautions that widespread use of the discovery in applications like solar cells is theoretical at this point. But, he is excited by the discovery's larger implications for understanding and exploiting the properties of organic semiconductors. "I believe that ubiquitous solar power is the key to powering our constantly warming and increasingly crowded planet, and that means putting solar cells on everyday objects like building facades and windows," Forrest said. "Technology like this could help us produce power in a way that's inexpensive and nearly invisible." The study is titled "Centimeter-Scale Electron Diffusion in Photoactive Organic Heterostructures." The research was supported by the U.S. Department of Energy SunShot Program and by the Air Force Office of Scientific Research. It has always puzzled me when people talk of transparent solar power cells. I just can't figure out how photons can pass through something freely while also being absorbed and turned into electrons. Anyone out there care to enlighten? Isnt it just that its capturing some, but not all of the photons? The absorption areas would be dispersed across the glass allowing for a mix of light to be absorbed and passed through. Or thats what I would suspect at least. I just can't figure out how photons can pass through something freely while also being absorbed and turned into electrons. You are correct about a truly transparent cell. 1) The human eye only uses wavelengths from roughly 400 nm to 700 nm. A cell that only uses ultraviolet (<~400 nm) and infrared (> ~700 nm) can look transparent to the human eye and still produce power from the UV and IR. 2) Most of the energy typically comes straight from the sun, and we don't look at the sun - our eyes thus use only use reflected light. Some concentrating designs only use the direct light that we don't look at, and let the rest through - these can be fairly transparent, although often 'translucent' would be a better description. 3) One can 'cheat' and use some of the usable light - a tinted exterior window that lets half the light through still looks pretty transparent from inside a room. YOU MEAN WALLPAPERS FOR SKYSCRAPERS ? WoW ! Politicians will commit suicide by jumping out of the windows then . Transparent means (in this context): "transparent to the human eye". There are many more wavelengths that are not visible to the human eye (e.g. infrared, ultraviolet). If you capture those and convert them to energy then there is no visible change to the glass (if you were to don infrared or UV goggles you would see a radical change. With those the glass would appear for you to turn from transparent to opaque). Especially IR is interesting because that's essentially heat: If you want to generate energy from abundant sunshine you probably want to avoid the heat that comes with it as well. So taking away IR photons that would otherwise heat your living room is an added bonus. The down-side is that transparent solar cells do not use the entire spectrum of light. That makes them - per definition - less effective than the dedicated full spectrum PV. The up-side is that we have windows in our homes in any case. So there's no extra installation surface or carrier structure needed to deploy them which could make them very cheap to the point of becoming a standard feature of any new window pane. Especially full glass office buildings represent a huge potential.